Eldon’s Germans defeated Ron’s Finns in June, 2015. After reviewing ROAR, balance was given to the Finns. The Germans set up on the north end of the boards, waiting for the Finns to arrive from the south. I googled Ylimaa and its in northern Finland, Lapland to be precise, which is pretty north. These Germans were on their way to Norway with the Finns reluctantly chasing them because the Russians politely asked them to. Facing south, the German’s right flank had a paved road going north south to a large woods which the Germans occupied. The left flank featured another road also going north/south, but it was not paved. The map was blanketed by orchards, which nicely simulates the boggy terrain full of tamarack and spruce (think northern Manitoba). Mud was in effect that meant the paved north/south road on the German’s right flank was the fastest avenue of approach. Anywhere off this road meant the Finnish tanks had a chance of bogging down in any open hex every time they moved. An unpaved east/west road connected the two north/south roads forming an “H”. It lay just in front of the northern woods on the German’s right. These woods would prove to be where most of the fighting would occur. The Germans had to prevent 30 Finnish VPs from exiting their side of the board. For this task they were given two 50mm anti tank guns, one module of 100mm OBA and about 10 elite squads with some support weapons. They set up the anti tank guns on the opposite ends of that east/west road, some infantry in the center of that road in sangars, and more in the woods and the German’s far left flank. The Finns appeared on the south board with the bulk of his 5 T34 tanks on the paved road. But in order to pin the Germans left flank they sent one T34 with low ground pressure on the Germans left flank, supported by infantry. The Fins had almost a 2:1 numerical superiority in infantry, but about a third of them were green (with a morale of 8, no less). Their infantry found it slow going lugging their Russian made machine guns through the mud but things started to happen quickly once they neared the Germans lines. The German’s OBA opened up with some good effect against the Finns on the paved road but after one FFE, the radio broke. The central German positions managed to delay the Finns but eventually broke and fell back, abandoning their sangars for the woods. The AT gun on the German’s left opened up against the T34 Lite but was ineffective. That tank ducked out of sight in order to support their infantry, but was knocked out by a squad with a panzerfaust skulking up from the rear. On the right flank the AT gun had a much better time of it, knocking out three T34s before their crew was eliminated. 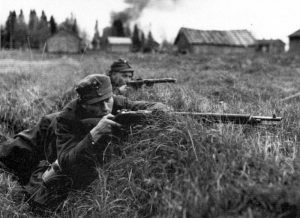 The Germans crystallized their defence at the wood’s perimeter and the Finns were unable dislodge them. Time ran out, and it was a German victory. Mud played a huge part in the scenario but not once did any of the Finn’s tanks bog down. I do think this scenario is tough on the Finns, even with balance. Their machine guns played little part in the battle and slowed their squads down considerably. Hard to imagine anyone abandoning them on the onset, though.